Pac-Land is an action game in the Pac-Man series that was originally released for arcades in 1984. It was made available on the Wii U Virtual Console in 2014 via the Nintendo eShop. Ever the pioneer in video game history, Pac-Man dared to do what few other games were doing at the time: scroll. 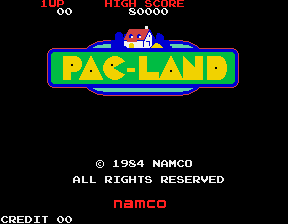 When Namco introduced Pac-Land into the arcades, they preceded Nintendo's own Super Mario Bros. as one of the earliest side-scrollers in history. Pac-Land was the first game from Namco to use a Hitachi HD-63701 sub-microprocessor and featuring parallax scrolling for some of the background elements, which was pioneered in 1982 by Irem with Moon Patrol. 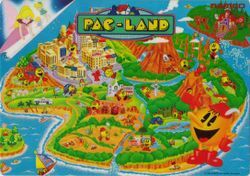 Pac-Land takes Namco's signature character Pac-Man out of his more familiar element – the maze – and places him in a lush side scrolling world, complete with towns, woods, mountains, and other various environments. Pac-Man's goal is simple. Make it from his home to the magic door that serves as the entrance to Fairy Land, so he can help a fairy who has lost her way return home. Upon completing this mission, Pac-Man is awarded magic flying boots by the Fairy Queen, which he must use to safely make his way back home, where his loving family, Ms. Pac-Man, and Baby Pac-Man, along with his dog Chomp-Chomp, and cat Sour Puss, are waiting patiently for him. Naturally, out to stop him are the usual suspects: Blinky, Pinky, Inky, and Clyde, along with the purple female ghost, Sue. But one chomp on a power pellet can turn the tables, providing Pac-Man with ghost-feared Pac-Power. Much of the game's design, in fact, was inspired by the popular Hanna-Barbera cartoon regarding Pac-Man's life in his world with his family, including the game's distinct background music. Pac-Land's concept was extremely novel for its time. Unfortunately, despite its dazzling uses of colors and animation, the game play falls a little flat. There are few secrets to discover here and there, but it lacks the discovery element, that made Super Mario Bros. much more successful when it was released for the Famicom in the following year. In the end, Pac-Land begins to feel like an obstacle course through repeated areas with ever-increasing difficulty, as opposed to feeling like you are exploring new territory with each new round. And the drastic departure from the original Pac-Man maze formula left many fans scratching their heads. Still, Pac-Land developed a solid fan base, and became the inspiration for many of Pac-Man's later adventures to come, includeding Pac-Man 2: The New Adventures. A wayward fairy has lost her way when wandering into the world of Pac-Land. Hearing about the great hero of the land, she sought the aid of Pac-Man in order to help her get back home. Accepting this great responsibility, Pac-Man invited the fairy to safely stay beneath his hat as he proceeded to find the magic door that leads to the fairy world. But the dreaded ghosts of Pac-Land hear about the lost fairy and wish to collect her for their own nefarious purposes. They believe she will grant them all of their wishes. So they set out to catch Pac-Man anyway they can: by car, by plane, by pogo-stick, even by UFO. Will Pac-Man return the fairy safely, to her home? And what will await Pac-Man on the other side of the magic door? You control Pac-Man with the left and right run buttons and the jump button. Double tap either run button to speed up Pac-Man's movement. Along the way, the ghosts will come towards you in various vehicles, while Sue alone trails behind you throughout each stage. Contact with any ghost (including the little ones that they drop) is lethal, unless you land on their heads. Each round has a time limit. When the time limit is up, Sue speeds up and rushes forward to kill you. You cannot outrun her, but it is possible to reach the end of the round before she catches up with you. In some rounds, you may encounter a Power Pellet. Eating one has the same effect as usual: the ghosts turn blue and can be eaten for a short period of time. Throughout your travels, you will find various fruits that you can eat for bonus points. The point value of the fruit increases until you've eaten your fourth one, and then it returns to the original value for the next four fruits that will appear. At the end of the first and second rounds of each trip, there is a "Break Time" sign. If you time your jump properly, you will be awarded bonus points for your position in the air when Pac-Man freezes. Some ground objects such as fire hydrants, cacti, and stumps, can be pushed to the left or right to reveal secrets such as a helmet, invisibility, and even a warp forward to Round 9. Once Pac-Man safely returns the fairy at the end of the third round of each trip, Pac-Man will be awarded magic flying boots by the Fairy Queen which he can use to remain in the air while returning home in the fourth round of the trip. These boots do not make him invulnerable so he must still avoid being attacked. This page was last edited on 13 February 2016, at 05:01. This page has been accessed 31,548 times.